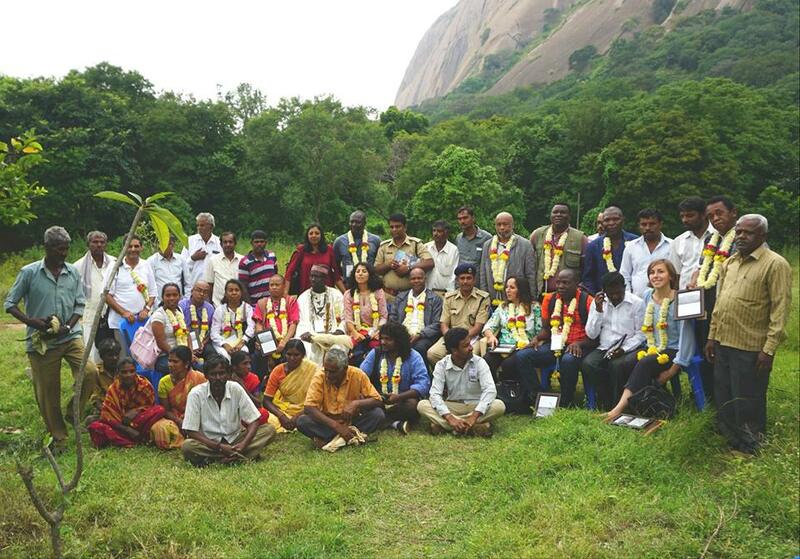 Stakeholders from 22 countries have initiated a formal follow-up network for implementation of the outcomes of the Community to Community Exchange and Capacity Building Workshop in Bengaluru, India from 2－4 October. The three-day workshop that was preceded by a series of field visits aimed to increase the understanding of the principles of Access and Benefit Sharing (ABS) set out in the Convention on Biological Diversity (CBD) and the implementation of the Nagoya Protocol at the local level using the health sector as an example. It offered a platform for traditional knowledge holders to exchange ideas and experiences of sustainable utilization of genetic resources and to discuss examples of ABS and innovative models for conservation, protection and valorization of biodiversity and traditional knowledge. Indigenous peoples and local communities (IPLCs) have high levels of knowledge related to identification of genetic resources that are utilized for medicinal, food, nutritional, as well as other wellbeing related purposes. To prevent erosion of traditional knowledge, documentation was seen as crucial by the practitioners at the workshop, because it helps to pass the knowledge onto younger generations of the community. Among innovative initiatives preventing the erosion of traditional knowledge, People’s Biodiversity Registers (PBRs) and the Traditional Knowledge Digital Library (TKDL), were seen as effective. However, not all traditional knowledge can be documented and the practitioners concluded that new methods are needed to ensure inter-generational transfer of valuable indigenous knowledge. Examples from India ― where the country’s three-tier institutional approach to implementing ABS grants authority over local resources and knowledge to the local communities ― as well as Africa and Central Asia were sources of good practices. An important lesson that the practitioners took away from the discussions was that in situ conservation is often the most cost-effective method for long-term conservation. In addition, in many countries women play a key role in protection and transfer of traditional knowledge, which suggests that proactive engagement of local women in conservation strategies yields better results. Other sessions touched upon the creation of small and medium scale enterprises, protection of tangible and intangible rights, awareness raising and the need for horizontal South-South cooperation between countries with traditional knowledge. Participation of local communities and traditional knowledge holders was seen as an essential component of decision-making and future policy formulation on all levels. The event was co-organized by the Biodiversity and Community Health (BaCH) Initiative (anchored by UNU-IAS), the ABS Capacity Development Initiative, Transdisciplinary University of FRLHT, Equator Initiative, and Bioversity International.